The most frequently asked question about injection molding revolves around tooling. What is a Bridge Mold? Is there a difference between Prototype Molds and Bridge Tooling? 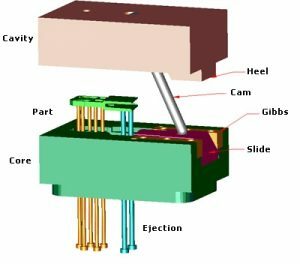 Are there limitations to Rapid Injection Molding? Is Rapid Prototype the same as 3d Printing? What is the typical cost of Rapid Injection Mold? Can I automate my Manual tool? What is an Automatic Tool? A bridge tool is often a prototype tool that produces production quality parts. The intent of bridge tool is to bridge the gap between prototype and production. Delays in the production tool often result in having to convert your prototype into a bridge tool. What is the difference between Prototype and Bridge Molds? At Xcentric there is little or no difference between Prototype, Bridge or Production tooling. While other injection molding companies differentiate between mold types, we take an engineering approach to building all our molds with production as the intent. During the engineering process, each mold is constructed and engineered based Annual Volume, Geometry Complexity and Per Piece Cost. As a result, our customers can use their molds how they see fit. A traditional molder cannot do this because of the typical cost increase between processes. Because of our technological approach to the mold building process, we are able to drastically reduce the cost of all our injection molds by as much as 75%. This is attractive to customers who want to use their mold for prototype and later decide they want to use for Bridge or Production. This is why we took it one step further and incorporated ISO, ITAR and UL into our process. What is Rapid Injection Tooling? Do not be fooled by the term “rapid injection molding. Simply put, Rapid injection Molding and Tooling just means it gets done faster. This is achieved through processes and technology. Some companies claim rapid tooling and injection molding but sacrifice quality. In addition, they are usually limited to simple parts and little to no undercuts , or they cannot handle large projects. It is also noteworthy, that their molds might have a limited life expectancy. Are there limitations to Rapid Injection Molding/Tooling? Yes and No! Other companies cut corners in order to become rapid manufactures. Because of this approach, they often compromise the life of the tool. However, at Xcentric we do not cut out any steps from conventional tooling or molding. By use of our proprietary technology platform, common mold components, state of the art equipment and a well trained staff, all coupled with a streamlined process flow, gives us the competitive edge over our competition. As a result, it gives us the ability to call our Injection molding process “Rapid”. Rapid prototyping is a broad term used for many manufacturing processes to make parts fast. In the early days 3d printing was referred to as rapid prototpying. This was because the process competed directly with traditional prototype methods. Although 3d printing seem to be the buzz today, the technology is actually over 30 years old. To compete with 3d printing services, there has been a major shift in the rapid injection molding and other processes that fit into the Rapid Prototyping arena. We offer the following Rapid Prototyping services to better serve our customers through all the manufacturing processes from prototype to Production. What is the typical cost of Rapid Injection Molding/Tooling? Because of the Rapid Injection Molding Process that XME has employed, lead times are greatly reduce, allowing us to provide our customers with the most competitive quote in the industry. We have reduced the cost of a typical injection mold by as much as 75%. Request a quote now and you will have a quote reviewed by our quote team in 24 hours or less. Manual Molds that produce parts with undercuts such as windows or clip, require side action, before the part can be removed from the mold. Undercuts in the part can greatly increase the cost of tooling. At Xcentric we are able to manufacture what we call hand pulls(see illustration Below). Hand pulls are used to reduce the cost of tooling or to make really complex parts. However, by incorporating hand pulls in to the mold design will require a molding machine operator to run the parts. The operator has to removes the hand pull from the part and then reload it back into the mold to make another part. This is a cost effective approach for low-volume part runs and highly complex parts but will result in a higher per piece price. Due to physical restraints within the mold body, parts with high complexity and multiple undercuts cannot be automated. None the less, when high volumes and lower piece price are required, automation of the hand pulls may be possible. Our quote engine and sales engineers will decide what the most cost effective approach is right for your project. A mold is automated by use of a slide and cam to remove the tool steel from the undercut in the part. Once the slide that forms the undercut is out of the way, the mold is free to open and eject the part. Tool automation is very expensive. However, when annual volumes are high, the cost is easily absorbed because of a much lower per piece price. Our quote engine and sales engineers will decide what the most cost effective approach is right for your project.